Several years ago I owned a book called The Perricone Prescription by Dr. Nicholas Perricone. He is a dermatologist that suggested a low-inflammatory diet to help keep your skin young. Although I was never able to stick to the prescribed diet, I'll never forget that one of the supplements he suggested to take was CoQ10. CoQ10 has also been recommended by Dr. Oz to help with elevated blood pressure. I was recently given the opportunity to try out OptimalXT CoQ10. I was able to get the product for free to facilitate this review, but all opinions are mine. CoQ10 is short for Coenzyme Q10. Coenzymes help enzymes in the body digest food. Your body naturally produces some CoQ10, but those levels start to drop around the age of 20. In addition to being a coenzyme, CoQ10 is also considered an antioxidant. That is where the anti-aging properties come in. Antioxidants help protect the body from damaging molecules. They also help boost your immune system. 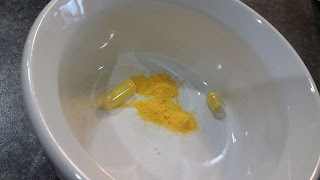 I've done a little research on CoQ10 and one of the articles I read said that the best form of CoQ10 is Ubiquinol, because it's the most easily absorbed by our bodies. 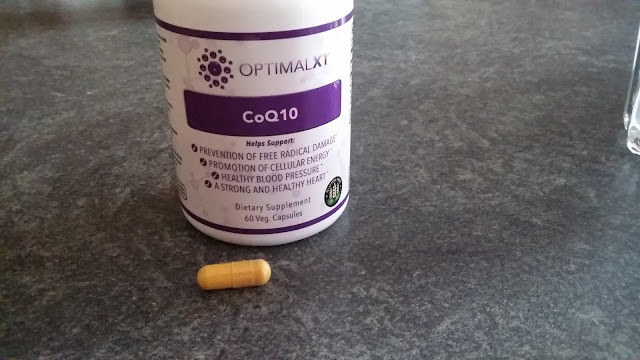 Unfortunately, I can't seem to find out anywhere online what type of CoQ10 OptimalXT uses. So, here's my experience with the OptimalXT CoQ10. Obviously, you swallow this as a capsule, I was just curious what was inside. *It's easy to take. I didn't have any problems swallowing it. *I haven't had any negative side effects. I've been taking it for about a week now and I haven't had any issues with stomach upset or insomnia. Those are two of the top two side effects listed broadly across the web. *You only have to take one capsule to make one dose. The recommended dosage I've seen across the web ranges from 30 mg to 300 mg, with 100 mg being the most commonly suggested dosage. Each capsule has 100 mg.
*The bottle comes with 60 capsules, so if you stick to the 100 mg. dosage suggestion it should last 2 months. *I do feel like I'm less tired during the day. It has not improved my immune system yet, as I feel I'm still battling a cold. But, I believe that it could take some time before stores are built up in my body and it could take longer than just a week of taking this supplement~~any supplement for that matter. The paperwork that comes with the bottle of capsules tells you that it could take 60 - 90 days before you begin to see results. It also suggests that you take it with a meal. Some of the other things that I've read on the web suggest that CoQ10 is fat soluble, so I think this should also be listed in their directions or on the box somewhere. I've also read that it might be better to take it at night. Also in the box was a paper that had a website listed to download a free e-book, but I could never get the link to work to see my free e-book. I also couldn't find the CoQ10 on their website. Maybe they were just having technical difficulties or the CoQ10 is their newest product and they don't have their website updated yet?? I like that the supplements are made in the US and contain no artificial ingredients. For those of you that it would be a concern for, they are also gluten-free. I think it will be interesting to see, if after more time, my blood pressure goes down. I think that will be the most easily verifiable benefit of the CoQ10. I think trying to trace my energy levels is subjective! I look forward to seeing how it works over time with my energy levels and immunity. And, hey! ~~ Smooth, more wrinkle free skin would be a nice bonus. If you're interested, Mayo Clinic has a list of conditions that CoQ10 could possibly treat graded on an A - F scale based on research and it's effectiveness. I found it pretty interesting. Have you ever tried to take CoQ10 for any reason? Affiliate links are in this post. Is it combined in one? I've ordered stuff from Dr. Mercola before several times-- I think K2 and Chlorella.. He always has interesting info. Thanks for stopping by and following. Hope to see you again soon!